The PURE Vieillitheque Series by EuroCave is a line of single temperature wine cabinets dedicated to maturing wine. The PURE line also offers an excellent design that allows the wine cabinets to be environmentally friendly by significantly reducing their energy consumption. The PURE series wine cabinets are all sold with MAXIMUM SLIDING SHELVES. Best Warranty of any wine cabinet on the market. The same great Eurocave name at a more affordable price point! The PREM - Premiere - Essentielle Series offers terrific EuroCave technology. Stores from 92 to 235 Bottles. Inspiration is the wine cabinet to install in your kitchen! Built in or Flush mount fit - these narrow depth wine storage cabinets work perfectly in kitchen or bar area. This Built-in Series allows for zero clearance for your wine cabinet. Same Hydro+ humidity management offered in the Classic Series. Stainless Steel Doors available as an option. Small & Large sizes available both with front venting. EuroCave Inoa cooled cabinets with presentation shelves housed within a Professional ShowCave. Small Bottle capacity - Thermoelectric unit ideal for condo's or where space is a concern. Preserve open bottles and store closed bottles of wine all in one cabinet. This cost is for additional/different shelves. Additional shipping charges will apply if shelves are ordered without cabinet. Like any natural product, cigars require specific care. They must be protected from extreme temperatures and stored in a moist environment. Cigars are generally stored at 17°C with roughly 70% of relative humidity. EuroCave offers a similar technology as researched for their wine cabinet line within the humidor to supply superior regulation of humidity and temperature. PURE - This elegant and understated successor to the hugely popular Classic series is more energy efficient and quieter than ever before thanks to improved insulation – better for the environment inside the cabinet and out. New Pure features include halo LED perimeter strip lighting with three settings and a removable handle on full glass door models. Removable/adjustable Main du Sommelier cradles support each bottle in protective isolation. Choice of three sizes, two door types and two standard shelving configurations. REVELATION - Dubbed the “jewel in the crown” of its cabinets, EuroCave’s Revelation is a perfect harmony of design and leading technology. 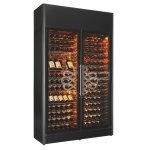 In addition to all the great features of the Pure, the Revelation also boasts two thermometers (one digital, one manual as a fail-safe back-up), double frost protection, a set of write-on reusable shelf labels and a EuroCave-best 5-yr. parts and labour warranty – true luxury in wine cellaring. Choice of two sizes, two door types and two standard shelving configurations. .
CLASSIC SERIES - The Classic Series by EuroCave offers wine cabinets that combine design and technology offering a wide choice of temperature ranges and EuroCave’s best features. Classic is the most popular of the EuroCave cabinets as these chilling units come complete with humidity cassette to maintain more consistent humidity levels, a full glass (FG) door and elegant pub style handle. Also, a more advanced control panel allowing for built in diagnostic tools and cabinet lighting. 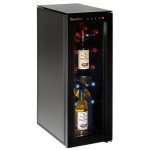 ESSENTIELLE (PREMIER) SERIES - The Premier/Essentielle Wine Cabinets are a simple and reliable series that meets the essential criteria of aging. Purely design for maturing wine. This series of wine refrigerators is a almost identical to the Classic line, however has a framed glass door with integrated handle and a simpler control panel to keep cost down - no lights and no fan. This line is a great value as the compressor, cabinet body, and cabinet shelves are the same as the Classic line. NEOFRESH SERIES - 5000 PROFESSIONAL SERIES - The NeoFresh range of wine cellars with delicate clean design lines, and over all low energy consumption, suitable for residential or commercial applications. Primarily designed for the commercial market with increased insulation and steel kick plate door to help protect against the wear and tear of commercial applications and restaurant life. Professional Series door and kick-plate for more challenging environments. No lava rocks for humidity assistance. COMPACT / BUILT-IN SERIES - The Built in (Compact) Wine cellars are designed to fit perfectly in your kitchen with dimensions adapted to the constraints of cabinetry. Same technology as the Classic series but specifically designed for built in applications as the units are front vented. 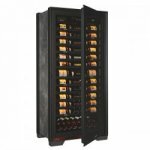 These wine fridges be used for both long term maturing of wine, or set colder for serving wine. A beautiful accent to any bar or kitchen environment. LA PETITE - Thermoelectric wine coolers, ideal for environments where space is a concern. This small wine cooler is often used in condo's or modern decor. Comes with glass table top to serve dual function. EuroCave, the inventor of the Wine Cabinet. Rosehill wants to ensure our customers are educated about the entire EuroCave line-up and what is available. That is why we have listed the full range of EuroCave product on our website. The Origine, Essentielle, La Petite and NeoFresh Series should be readily available. The Classic and Compact may be a special order item depending on your selection. Please contact for availability. The Origine, Essentielle, La Petite, NeoFresh & Classic Series are Free-Standing. The Compact/Built-in series can be built-in.